Gigabyte has just launched a new mini-PC in its range Brix, the Brix Gaming UHD. We had already glimpsed quickly this model at Computex . Visually, it is a tower with a square base (11cm side height 22cm) with a flattened area in which we will find the connectors on the motherboard, namely two USB 3.0 ports, two USB 3.1 ports (one Type-a and Type-C), a Gigabit Ethernet connector, audio jacks and two connectors for WiFi antennas. To the left of these ports, we will find those of the graphics card, namely a three HDMI and Mini DP. On its website, Gigabyte highlights the existence of two models, a Core i5 and the other Core i7 Skylake generation. So we will have to choose a Core i5-6300HQ (2.3 / 3.2 GHz) or Core i7-6700HQ (2.6 / 3.5 GHz). For the rest the same characteristics with a motherboard using the Intel chipset HM170 with two slots DDR4 SO-DIMM. The circuit is quite original because the motherboard is placed diagonally in the housing while the graphics card, GTX 950 with 4GB of GDDR5, is placed on a corner of the case. This is an MXM card placed on a custom PCB. The latter is connected by two wires to the motherboard to switch the PCI Express signal. The graphics card is dominated by an angled radiator. On the motherboard, there are two slots M.2 2280, respectively connected to the CPU and chispet and an M.2 PCIe slot in which is placed the Intel 8260 WiFi card (ac). We can also place two SATA 2.5-inch, one behind the graphics card, and the other in the opposite corner next to the processor heatsink. Cooling is provided by a single 92mm fan that draws air from the bottom and passed through the housing to come out on top. 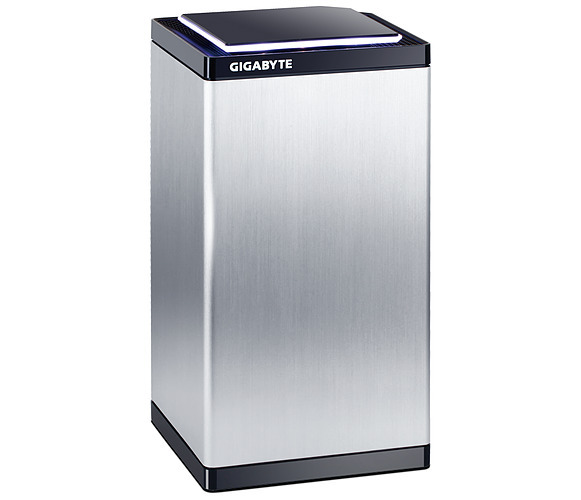 This design Gigabyte has the merit of being original, even if it reminds us, at least in the idea of his diagonal motherboard Mac Pro . Gigabyte announces a price around 949 euros for the Core i7 version without clearly specifying availability should happen in the coming weeks.